One of my peeps suggested I tell this story. Sometimes, admitting your own idiocy is good for the soul...I wish I could say this was the only time I ever embarrassed myself. My friend, Bogg, and I were in the mood to go out to lunch one day. We both worked together and decided that getting out of the office occasionally would be good for our sanity. With only a hour to kill, we determined our favorite Chinese buffet would be the best bet. Give us seats and plates, and we'd serve ourselves, chomp it down, and get back to the office before you could say "moo goo gai pan." The thing about having a favorite Chinese restaurant is that it is rarely a secret. Americans like Chinese food like they like...well, American food. Arriving at the restaurant, we realized it was packed, of course - it was lunch hour! But, what the heck! Those people had to get back to work, too. Besides, we were salary, and if you factored in all the extra unpaid hours we put in, we were probably making a dollar an hour..if lunch went over, so what. Standing in the lobby of the restaurant, the hostess took out names. I started to wonder if we could pull it off, and I asked how long it would be. The hostess assured me that guests were getting seated quickly. Bogg and I stood shoulder to shoulder with about twenty-five people; uncomfortably so. Observational chit-chat filled the time. Visually, I scanned the room; they had just redecorated the place. Suddenly, I saw this guy. This HUGE guy. He was about 6' 7" and the most striking thing about him was that he looked exactly like Bluto, from the Popeye cartoon. Exactly! "Bogg...Bogg...slowly turn and look straight ahead..." I whispered. Bogg complied. Continuing, I added, "Now, look at that gigantic, mondo, Jethro-sized Bluto guy on the far end of the room..."
Bogg looked forward, paused a moment, and a smile slowly developed - then she said, "Uh, Cher...that's a mirror." I froze, and then allowed my gaze to wander beyond Bluto-man. I saw a very familiar face: mine. And there was Bluto...standing behind me. Directly behind me. It gets worse, Cherdo. 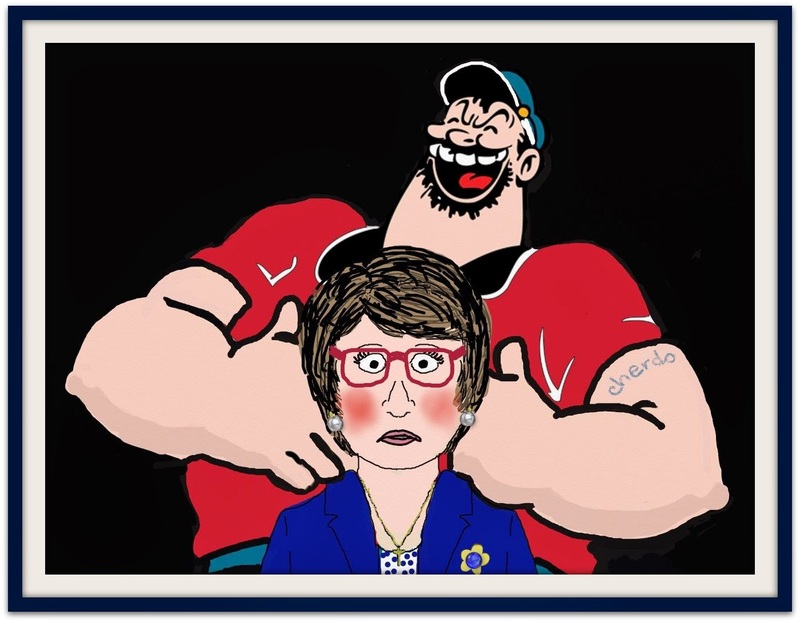 That gigantic, mondo, Jethro-sized Bluto guy standing behind you was ME, Shady. I was there that day for the all you can eat buffet. Insulted when I overheard your unflattering remarks, I turned around and took my appetite elsewhere. I ended up having lunch at The Cheesecake Factory because I love their Olive Oyl. I hope your week is off to a great start, Frau Flipside. Have a happy Monday and I'll see you tamale. To answer your deleted question, it would have to be FALSE... because ice cream doesn't have bones. Guten Morgan! Es ist ein wenig kalt an diesem Morgen. Ihr Haus ist wahrscheinlich sehr warm. Dear Shadiness, I wish I could say I don't have any more embarrassing tales. I really wish that were the case. If you had a small crane to get me going today, it would be lovely. Have a great day! Shecky Shady says: Your wish is my command, dearie! Yepper....true, true, true. Open your mouth only to change feet. Okay. I have to start with Shady's flied lice. When The Hurricane started college, she worked in a Chinese restaurant for two years. EVERY time I spoke to her, she told me that yet another idiotic old man had come in and ordered flied lice, and then smiled at her as if it were hilarious. She always ignored them, Hurricane style, as geniuses tend to do with imbeciles. She wiped their sorry butts right off the planet. Those old men are all dead now, or so severely damaged that they are in nursing homes. As for the reflection in the mirror, it didn't happen, Cherdo. It was your imagination playing tricks on you. None of it ever happened. You know you can trust me. Besides, I happen to know that Bluto was deaf. What??? I paid another comedian $100 for that "flied lice" joke. He assured me it was brand new! You're still here... but I'm not all there, get it? Oh, if it were only true that none of it happened. Ha ha ha. It didn't happen, I'm not here, and Shady never used the flied lice line. Those mirrors always throw me off! We used to go to a Chinese buffet for lunch. There was a guy who ate there every day who sat there blowing his nose and coughing up phlegm throughout the meal. Finally we started asking to be seated on the other side of the room from where we knew he always sat, even if he hadn't shown up yet! Oopsie! I assume Bluto did not hear you? He was probably too busy thinking about the Chinese combo plate he was about the order and devour. We can only hope! I've retold this tale through the years, and I feel more ridiculous each time. So, I sit down, fire up my laptop, intending to do some down and dirty editing. I think, 'I should check my bloggers', and forthwith head to the blogosphere. A lot of good posts, people I enjoy, and I get to a depiction of Bluto with a caricature of yourself. Wha-? I buckle down to read and am now sitting here in a state of silly amusement.